Are you looking for the best things to do in Boston during your upcoming Boston vacation or Boston staycation? Sometimes before I travel to a new city, I look for the “must-do” or “top attractions” list without any regard to the cost. However, since this blog is all about budget-friendly fun in Boston, I thought I could combine the top things to do in Boston with budget-friendly tips and attraction discounts! Even better, some of the best and top things to do in Boston are FREE or inexpensive already! 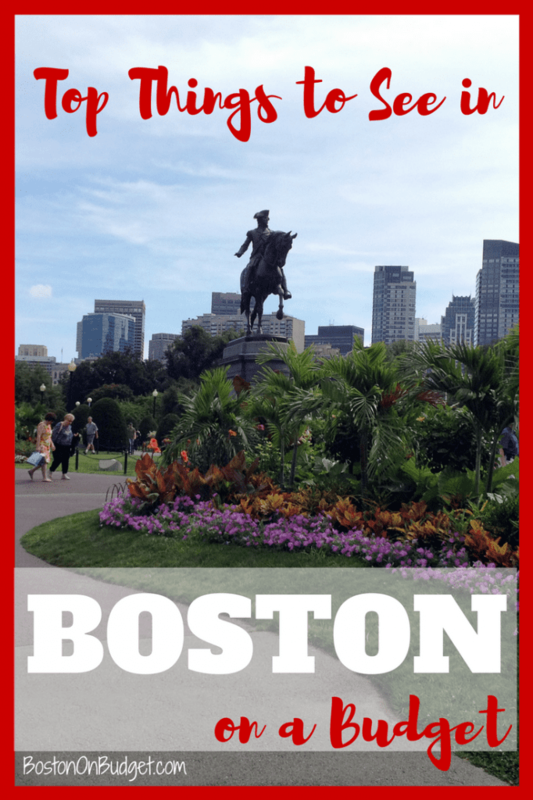 If you are visiting Boston for a few days, you may want to consider buying a Go Boston Card or Boston CityPass which offers a package of attractions at a discount price. It really depends on how many attractions and days you plan to visit and how aggressive of a traveler you are. Read: Is the Go Boston Card worth it? and Is the Boston CityPASS Worth It? to help find the best fit for you! If you do nothing else in Boston, and even if you claim to hate history, please at least step foot on the freedom trail. You’ll find it’s hard too ignore the freedom trail with 16 official sites that are connected with a red brick path. Most of the attractions on the Freedom Trail are free and you can print out a map to do a self-guided tour without the need to pay a tour guide. Anyone can start from the beginning, middle, or end of the freedom trail; just keep in mind some historic sites may close by 4-5pm whereas other sites like Boston Common is always open. Duck Boats are a popular site in the streets (and Charles River) of Boston during the summer months. A Boston Duck Tour is a great way to start off your Boston vacation because the 80-minute tour will give you an overview of the city with many popular Boston attractions highlighted on the tour. Boston Duck Tour tickets can be expensive at $35.99 an adult but you can save up to $9 on a ticket if you are a morning person and take an early tour. Also, Goldstar Boston sells discounted duck tour tickets for $24.21 + service fees for select duck boat tours. Also, if you are purchasing the Go Boston Card, Boston Duck Tours are included in select packages so that may also be a good money-saving option for you. Groupon will often have discounts on the Super Duck Tours which are a little different I believe but still a fun and affordable alternative. There are also other tours in Boston that will give you the lay of the land if you don’t feel like quacking at pedestrians during your visit. Boston has so many great museums and where you visit may depend on your interests, age, and how much time you have. The Museum of Science, Museum of Fine Arts, and Isabella Stewart Gardner Museum are personally my favorite museums in Boston. However, if you are traveling with kids, you may want to add the Boston Children’s Museum or New England Aquarium to the list. All Massachusetts residents are eligible for a Boston Public Library card and BPL cardholders can receive free and discounted admission to many Boston Museums including free admission (with advanced reservation) to the Museum of Science and New England Aquarium. If you are a Massachusetts resident, it is definitely a great perk and worth using! Below is all the museums in the Greater Boston area that has free (or practically free) museum entry on a specific day of the week or every day of the week available to everyone, unless otherwise noted. Commonwealth Museum is free during open hours (Monday-Friday 9-4:45pm). Museum of Bad Art in Brookline is free 10am to 10pm from Monday-Thursday and until 6pm on Fridays and Saturdays at Brookline Access Television. The Somerville location is free with a movie ticket and the Dedham location is temporarily(?) closed. Bank of America Cardholders can also receive free admission to many museums like the MFA and MIT Museum the first weekend of every month with Bank of America’s Museums On Us program and Military Members can receive free admission to many Massachusetts Museums from Memorial Day to Labor Day with the Blue Star Museum initiative. Fenway Park is the oldest baseball stadium in America, opening their doors in 1912. Fenway Park is home to the Boston Red Sox and you can catch a baseball game there during baseball season. However, if you are visiting Boston during an away game or off-season, you can still visit Fenway Park with a tour. Fenway Park tours are available year round for $18 per adult. Children 3-15, students and military are $12 per ticket. If you are looking to save money on a Fenway Park tour, AAA Members can save $1 with your card. Fenway Tour admission is also included with the Go Boston Card for those interested in that discount card. Another great and fun way to see Fenway Park is through a Red Sox game. There are many different ways to buy tickets for a Red Sox game but I do recommend buying tickets beforehand than at the gate day of. Game day tickets are on sale 90 minutes before a game and fans can wait up to 5 hours in line. There’s really no benefit to buying tickets at the gate and is a lot more hassle to do so. If you are looking for face value tickets, you can buy sox tickets directly through the Red Sox website. Remember to add ticket fees to the ticket amount. (Ticket fees are $4.50 per ticket and $7 per transaction, so for two tickets it would $16 in fees). You can find the 2015 Boston Red Sox Schedule for home games, ticket prices and more. For more ways to save at Fenway Park, check out Red Sox Games on a Budget. Boston Common and Public Garden is a must during a trip to Boston. During warm months, ride the swan boats especially if you have little ones. Take pictures of the park, stroll, and enjoy both Boston Common and Public Garden. The parks are right next to each other and easy to do both in a visit. Boston Common is the oldest park in the country and is almost 50 acres in size. Public Garden was the first public botanical garden in America and is home to many beautiful and exotic plants. Boston Common is home to Frog Pond which has ice skating in the winter months and a spray pool and carousel in the summer months. There are so many events that happen at Frog Pond and Boston Common as well. Boston Common is also the start the Freedom Trail is a great place to start or end your day. Boston is home to many beautiful parks and visiting a park is a great way to spend time in Boston on a beautiful day. Faneuil Hall, a Freedom Trail stop, is a great place to visit to eat, drink, and shop as well as enjoy street performers! Faneuil Hall is free to stroll through and people watch but you do need to pay for what you eat and buy. However, there’s a food hall inside with a lot of different food options available at a counter. During busy times seating can be hard to find in the center but you can always take your food outside or on the go. Also, if you have a plastic Charlie Card, make sure to bring it to Faneuil Hall because a lot of vendors and restaurants offer discounts with the Charlie Card! Many restaurants in Faneuil Hall will also offer happy hour type specials with food deals (discount alcohol is illegal in Massachusetts). Throughout the year, Faneuil Hall Marketplace has so many events and activities and you can view upcoming events at Faneuil Hall. Head down to Boston Harbor to walk, cruise, or visit the Boston Harbor Islands and much more. There’s so much to do. Get out and explore the Boston HarborWalk and you can even download a free audio tour to learn more about the Harbor during your travels! The Boston Harbor Islands is also a fun place to spend the day during the warm summer months. Six islands are accessible by ferry from Boston with Georges Island and Spectacle Island being the most popular. Georges Island is also home to Historic Fort Warren, a civil war-era fort which is free and fun to explore! Georges Island is open from May to Columbus Day weekend in October. There are both restrooms and food available on Georges Island as well. The Ferry to Boston Harbor Islands is $17 per adult and $10 for children roundtrip. If you are a Boston Public Library cardholder you can request 2-for-1 ferry tickets for up to 4 people for weekday ferries. In addition to the Boston HarborWalk and the Ferry to Boston Harbor Islands, a Boston Harbor Dinner Cruise is also a fun option. The Spirit of Boston and Odyssey are the two biggest companies and both provide dinner and dancing while cruising around Boston Harbor. The Spirit of Boston and Odyssey can be expensive; however, there are many discounts available for both cruise lines. Restaurant.com: Both Odyssey and Spirit Cruises have vouchers available on Restaurant.com for $25, with a minimum spend of $37.50. $25 vouchers go for $10 at regular price, but promo codes are often available to lower costs. Goldstar Boston: Goldstar Boston has discount tickets for both the Spirit of Boston and The Odyssey starting at $53, depending on cruise dates and more. Also keep an eye out at tourist booths and more for discounts to the Spirit of Boston and Odyssey as well as Groupon and LivingSocial for daily deals. The Go Boston Card includes a USS Constitution Cruise, a Charles Riverboat cruise, and ferry to Martha’s Vineyard and Nantucket if you are interested in getting on the water with the discount attraction card. Goldstar Boston also a lot of discounts for cruises and ferries along Boston Harbor and much more. Goldstar has discount tickets for a Boston Harbor Lighthouse Brunch Cruise, Summer Party Cruise, Boston History Cruise, Romantic City Lights as well as discount ferry tickets to Cape Cod aboard the Provincetown Ferry and many more cruise and ferry offers! Groupon and LivingSocial are also great places to check when it comes to discount cruises and whale watching tours during the summer months! Getting on the water is a great way to see Boston if you have the time! Brewery Tour of Sam Adams or Harpoon Brewery. If you over 21+, check out a brewery tour of Sam Adams, Harpoon Brewery or another Boston Brewery. (I personal like the tour at Harpoon over Sam Adams better because the location is more desirable, the tour is more informative and they give more beer although the price is higher at $5 compared to suggested donation at Sam Adams). Visit the North End: I highly recommend having at least one meal in the North End! Some restaurants do not take reservations but others do and can be made through Open Table in advance. Some North End restaurants also participate in Restaurant.com discount voucher program as well if you’d like to save some money. See a Show. Head to the theatre district to see a show or head to a comedy club. The Blue Man Group also performs in Boston and can be fun to see. Visit Cheers: Head to the bar of the popular television series. There are two locations in Boston but the location near Public Garden on Beacon Street is the original instead of Faneuil Hall. Happy hour specials are available at both locations. Enjoy some seafood: Seafood is fresh and delicious in Boston and I know grabbing good seafood is on a lot of tourist bucket lists. You can find seafood at almost any restaurant in Boston although some are better than others. Cambridge: Head across the Charles River to Cambridge to visit Harvard Square and much more! Stroll along Newbury Street: The Back Bay is one of my favorite neighborhoods in Boston and Newbury Street is a popular street filled with boutique shops, restaurants and more. Window shopping is smart if you’d like to keep it budget-friendly. Catch some skyline views: The Prudential Center in the Back Bay is a great spot to catch some skyline views of Boston with the Skywalk Observatory open to the public. The Skywalk can be pricy if you don’t have the CityPass or Go Boston Card but you can head one floor higher to the Top of the Hub. Save money and skip dinner and buy a drink at the bar at the Top of the Hub instead and enjoy the view. Don’t forget to check Groupon, LivingSocial, and Goldstar Boston for discount tickets and attractions. What is on your Boston Must-See list? If you live in Boston, what suggestions to do you have for the Boston tourist? *This post contains affiliate links to help support the blog if you make a purchase through a link (thank you). Please see my disclosure policy if you have any questions.